Process West’s young, yet infamous Verticooler is now available for you 2015 WRX drivers. So what is this “Verticooler” we speak of? 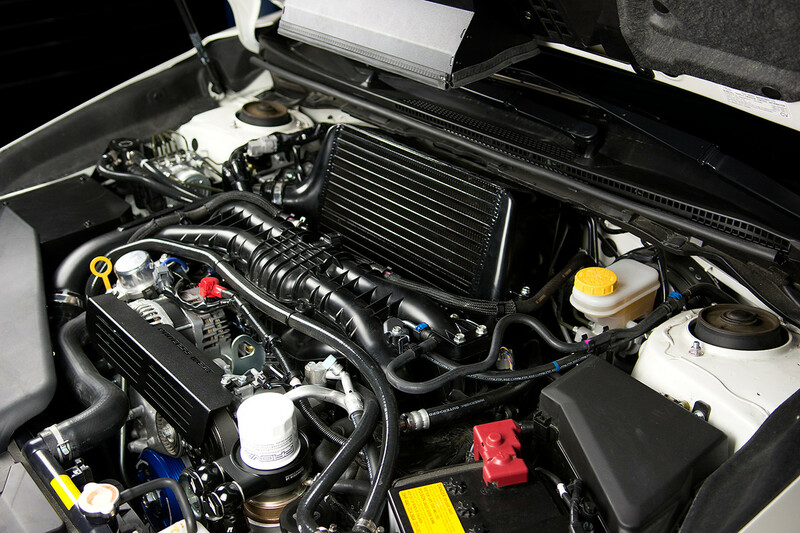 Well compared to conventional WRX intercooler designs, the factory top mount intercooler lays flat on top of the engine. The air is forced through the factory hood scoop where it slams into the ducts, and has to make a 90 degree downturn into the intercooler. By all means it’s not a bad design. Process West likes to add the sauce however. The Verticooler sits in the engine bay, vertically at a 15 degree angle so that the air is forced to SLAM into the intercooler. The cooler the intercooler, the happier the engine is. This equals more power, more response, more importantly, more brapping. This is the most efficient top-mount location intercooler on the market. In conclusion if you want the ultimate intercooler upgrade in the stock top mount location, you will be hard pressed to find a superior option. It comes with all the required hardware, brackets, ducting, everything you need for a Saturday afternoon wrench session. Be sure to check us out at www.rallysportdirect.com for more information. Life is too short to stay stock.